It is not uncommon now to see young babies with a string of amber beads around their necks when they are out and about shopping, swimming and playing with their families. This seems to be a growing trend in Australia, but in fact it is common and has been for many years for babies and children to be seen to be wearing Amber in European countries. Many people class it as a crystal or a gemstone, but in actual fact Amber is fossilized resin from trees. It comes in many colours from deep red orange to light golden yellow. 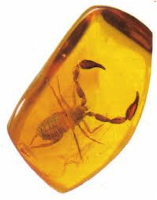 Interestingly, it is not uncommon to find fossilized insects inside pieces of Amber. Insects became trapped in the resin when it was sticky, before it had set. Amber is a warm stone with a sunny energy. It is said to enhance the beauty of the wearer. How Can Amber Assist the Wearer? Amber is a powerful healing stone. It carries a negative electric energy charge and therefore is good to draw power and energy to its bearer. It absorbs negative energies and transmutes them into positive forces that stimulate the body to heal itself. Its sunny energy is said to draw sickness from the body and negativity from the emotional energy. · *Can be used as an elixir for wound healing, as it is an excellent antibiotic. · *Excellent for inner child and past life work. · *Helps turn the intellect into more spiritual paths. Amber has been used in Europe for centuries as it is a natural analgesic and will calm a baby without the need for drugs such as Panadol or Bongela. Amber has natural anti-inflammatory and pain relieving properties, which are ideal in soothing the discomfort experienced when a baby is teething. Amber warms against the skin, which in turn releases its therapeutic properties safely and naturally. In 2012 I tried an Amber teething necklace on my third child during his teething stage. Without a doubt I can say that the difference in his reaction to teething with the necklace on was truly notable. Whilst wearing the necklace, my son had a reduced amount of pain, dribbling as well as redness in his cheeks and swelling in his gums. I also did not have to give him any pain relief. I was worried at first that the beads would irritate my son around his neck and he would try to pull them off, but they are so light that he never seemed to notice that he was wearing them. The teething necklaces need to be used with caution. It is recommended not to leave them on your child during sleep or if unattended. Also they are not for chewing. Cleanse Amber under luke warm water when you notice that it warms ever so slowly when you wear it or hold it. Negative energy can make Amber go cloudy. To purchase a Amber Children's necklace, please click here. 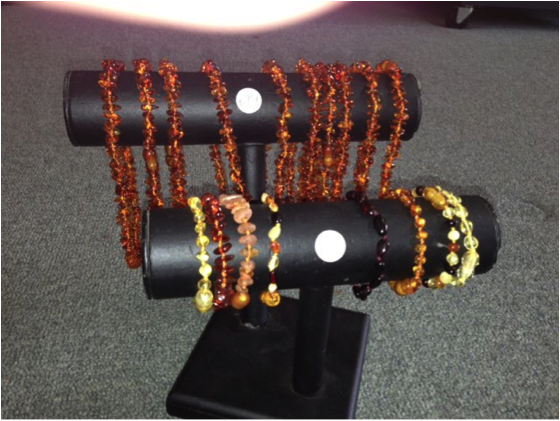 To purchase a Amber bracelet, please click here. Looking Amber is really something different. If you want to know the design & quality of Amber fossil from drfinejewels then just go through that.